I am inspired by the human need to explore, map, and make sense of an environment. This may be expressed at times in ornamental ways. 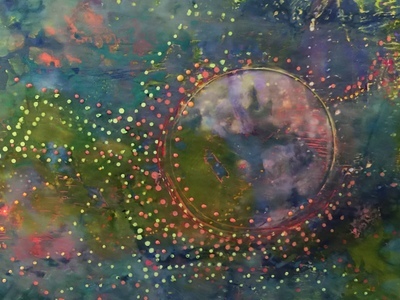 The repeated dots in my paintings reference the repeated babblings of an infant who is exploring his world through mapping the sounds he hears. They reference the careful marks of an explorer who maps a new frontier so others may follow. They reference the careful stitches of a decorative sewist. The story told is of a universal human desire to explore, conquer chaos, and beautify our surroundings. My work is informed by the importance of decoration across cultures. In some places, such as Italy, it seems at times that no surface is left untouched by the artisan's hand. The riot of beauty touches the observer in a primal way. In aboriginal cultures, the artists often use repeated dots to tell (and to obscure) their dream story. From early cave paintings to couture design, decoration and detail form a crucial part of the artist's language. I do not fear decorative markmaking; it is an essential part of my work.